My youngest brother came to shoot at a pistol match with me. He has some experience shooting a pistol. Its not very much. He does need to learn more of the fundamentals of how you handle it tactically. But he is very enthusiastic to learn. I have my 92FS for him to use at the match. We shared it. I don't own any other 9mm handguns to use. What a great weapon for him to learn with. All the safety features that you can't go wrong with when teaching gun safety. He followed every step. It was about 22 degrees out that day in the middle of January. And the 92FS worked flawlessly for my brother as a first time shooter in that weather. The first stage of the match was shooting 6 steal plates at 11 yards. You shoot as many rounds as it takes till all 6 plates are down. Rules are that the first magazine is to hold only 11 rounds. All other magazines after that are 10. I have seen as many as 20 to 25 used. But there are some shooters who do so well that they only use 6 to 8 rounds. They let me shoot before my brother so he can watch how its done. When you load the first round with the 92FS, you can take the safety off before you holster the weapon. But the hammer has to be forward. Then when you draw to shoot the first round, it will be double action first pull. It was cold and I usually never get the first plate on the first shot. So this time, when I drew the weapon and raise it up to shoot, I cocked the hammer manually. The first plate went down with the first shot. It took me less time to do that then to take the time to waste the first shot on double action pull. I plan on doing that every time from now on. No more wasting that first round. This is a picture of my brother shooting for the first time ever for a competition. They allowed another shooter between us so we can have time to change over the weapon from my hip to his. And during that time I can answer any of my brothers questions. What is best about the people I shoot with is that we all get along great. Anybody and everybody there is willing to help eachother. Its the best part of being there. After that it came time for my brother to shoot. He never competed before. 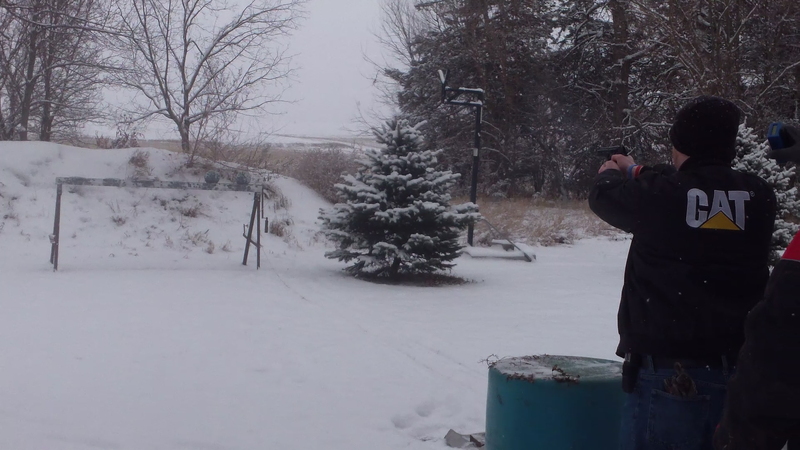 His experience shooting a handgun involved just plinking. Mostly aiming at the general direction of the target and shooting for fun. This was his first time ever where every round counts and thats it timed. Now, I love my brother. But I honestly was a little worried how he would do. I thought to myself. Please dont waste a lot of ammo. Please dont miss. Please dont go to fast. Please dont break a rule. To my amazement, and everybody elses, he did great. He even manually cocked the hammer for the first shot and hit the first plate like he has done it before. The norm is usually to try to shoot the plates down in less than 1 magazine. With eleven rounds in the first magazine, he did it with ten. The first 3 plates went down with his first 3 shots. Then he took 7 more shots to take down the other 3. I think he started rushing it. But he got the right idea. After that, the other stages were like nothing to him. He paid attention to everything and shot groups like he was a natural. I am very proud of him. My brother talked a lot about how much he loved shooting the 92FS. Still does. He had so much fun that I foresee him coming out to compete more often. He even talked about how interested he is on possibly purchasing his own handgun. Until then, I would proudly allow him to continue to use my Beretta.